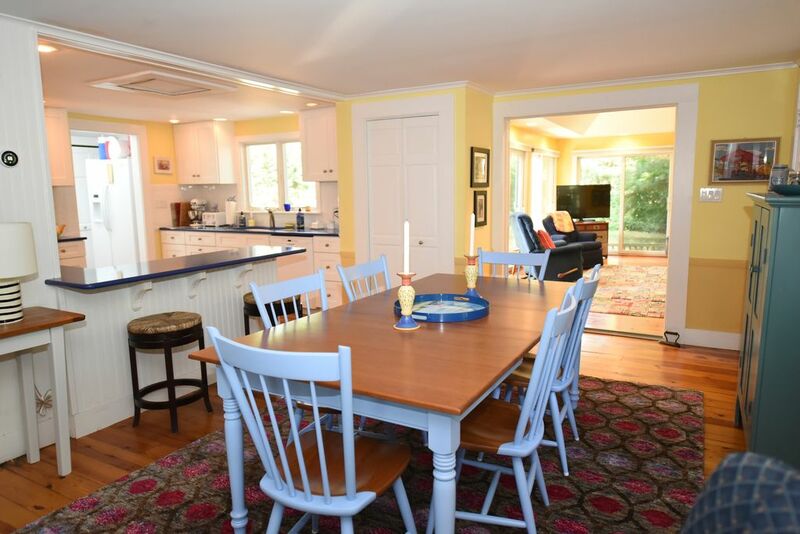 This Cape Cod cottage is spacious and well equipped, with a very large and private yard and deck. Beautiful, new, bright kitchen with blue quartz countertops and handmade starfish tiles. Plenty of counter space and storage, a joy to work in. Recent addition of large family/sunroom with two walls of sliding doors, allowing nature in. Very peaceful atmosphere to relax in after a great day at the wonderful local beaches, both ocean and lake. There is so much to entertain all tastes in the immediate area. Coastal Living Magazine chose Harwich Port as the #2 Happiest Seaside Town in the United States in their 2013 Summer Edition. Very close to bike path, few miles from beaches. Cape Cod baseball league games nearby. Grocery store approx. one mile away. This cottage has been part of our family for over 50 years. It's our family gem and we have lovingly updated it. Many of our returning guests call it 'their cottage'! This cottage is lovingly passed from generation to generation and is kept in wonderful condition for each one. We recently worked together on a beautiful new kitchen, a new bathroom and completely redid our bunkhouse, which is adorable. The whole family enjoys doing these projects together. We enjoy our new large sunroom even on rainy days. You feel like you are outdoors and can enjoy nature. Bank St. beach is one of the nicest on the Cape and it's just a short drive away. The Harwich Mariners, Cape Cod baseball league, play nearby and are a perfect way to enjoy an expense free evening. The famous Chatham Friday night band concerts are in the next town and is a great event for the whole family to enjoy. A great way to finish the day, after the beach, is some delicious seafood and home made ice cream, all nearby! The trampolines and go carts are within a few miles, as is the movie theatres. The bike path can be reached right up the street. Nearby are some wonderful playgrounds for the kids at the local Harwich schools.The main street of Harwich is thriving with shops and restaurants. Washer in pantry adjacent to kitchen. Dryer in pantry adjacent to kitchen. Two separate living rooms with French doors connecting, span 40 plus feet when open. Dining area is included in this space. Washer and dryer in pantry, as well as all linens, beach towels and laundry detergent, toilet tissue ,etc. Dishwasher,Kitchen aid mixer,toaster oven,toaster,coffee maker,etc. New solid cherry dining table and chairs with seating for six and capacity for extension to 10. Dining table and chairs with cushions.Picnic table in yard. This is our favorite spot on Cape Cod! The cottage is beautifully decorated, meticulously maintained, and in a great location. Can’t wait for our next visit! We loved the cottage and the area it was in - very guiet but easy to get to everything. We felt like we were home but without all the day to day distractions. The cottage was very clean and comfortable and all the extras that were already there were nice. We hope to go back next year! We’ve stayed at numerous cottages over the years and this one is one of the best. Thank you so much for a perfect vacation! We're so glad that you had a nice vacation and really enjoyed the cottage. Thanks so much for leaving it in such beautiful condition. We sure appreciate it! Hope to see you again! Best VRBO place we have stayed at. We loved staying at this cottage! It was so comfortable, clean and Vicki was top notch at having everything we could possibly need. We really wish we had planned a longer stay at this home, and if we return to the Cape, we will definitely try to stay here again. Thanks so much Terre for your great review! We hope you get back to Cape Cod some time in the future, we'd love to have you stay with us again! Beautiful, clean, well-stocked cottage that feels like home! We just returned from a lovely long weekend at this absolutely perfect cottage. It is exactly like the pictures show only better! The place was very roomy, clean, and well-stocked with staple supplies which I never expected! The kitchen included so many items for baking and cooking that it felt like home. You can tell that the owners put a lot of time, energy and thought into making this a comfortable and enjoyable vacation cottage for renters. We look forward to returning! Just what you would imagine the Cape to be..
Our family of four thoroughly enjoyed our stay in your home. It's close to everything, the beach, shopping, bike trail and yet still so private you feel secluded. Our kids loved all the cozy blankets and we slept good on the soft beds. Only thing we wish as parents was if there were locks on the doors to both the bathroom and the main bedroom. Other then that the home was adorably decorated and we loved all the natural light in the sun room. This home looks so much better in person then the pictures show. We will definitely consider staying here again. Best place on the Cape! I can't overstate how wonderful this cottage is. It is beautifully decorated, meticulously maintained, private, conveniently located, and super comfortable. You can tell the hosts put great care into this property because it felt like a home away from home. Communicating with the hosts was super easy and I felt very comfortable asking questions and making reservations. I can't wait to book again next year!